The Urban Wood Network (UWN) will present a free informational webinar at 11 a.m. Tuesday, April 17. If you have an interest in help advance the urban wood movement, then sign up now to attend. This is a great opportunity to get acquainted with the UWN, its mission and its aspirations. In addition, you’ll be able to ask questions and provide much welcomed input. The Urban Wood Network was launched last summer by representatives of Illinois, Michigan, Missouri and Wisconsin. Membership is not only open to entities and individuals in those states, but to others east of the Rocky Mountains. Speaking of webinars, the Wood Education and Resource Center will present its Spring Urban Wood webcast on Tuesday, April 3. Highlights include updates of the Urban Wood Network and work to develop urban wood certification standards. Read this month’s Illinois Urban Wood Update for more details about each of these webcasts and registration information. Also, this month, read about the Virginia Urban Forest Council’s new urban wood business directory and the latest updates on the spread of the dreaded emerald ash borer throughout North America. Don’t forget to share your urban wood success stories, photos and experiences. Add the Virginia Urban Forest Council to the growing list of organizations upping their game to promote the creation of local urban wood networks. The VUFC recently created the Virginia Urban Wood Group and developed an Urban Wood and Small Woodlot Forestry Business Directory for its website virginiatrees.org. The directory allows businesses throughout the state to list their products and services including custom milling, drying kiln, lumber sales and custom made furniture. Users of the guide can search for specific products services either state wide or narrow their search to a single city to find a local source. Utilizing outreach, education and innovative workforce development to assist in the development of small acreage service providers which can fill a contractor void between the arborist and the traditional production logger. Improving the utilization of Virginia’s urban and small woodlot forest resources via enhanced marketing opportunities. Access the Urban Wood Business Directory. 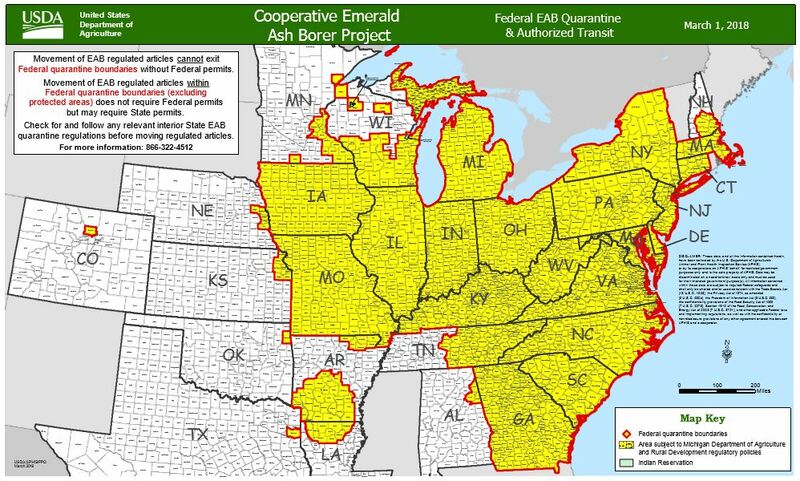 The emerald ash borer’s wide path of destruction is captured in the latest North American map of areas under quarantine. Firewood and nursery stock are restricted from leaving the quarantine zone which now includes all or parts of 31 states, Washington, DC, and Ontario and Quebec. According to the U.S. Department of Agriculture’s Animal and Plant Health Inspection Service (APHIS), since its discovery in southeast Michigan in 2002, emerald ash borer infestations have been detected in Alabama, Arkansas, Colorado, Connecticut, Delaware, Georgia, Illinois, Indiana, Iowa, Kansas, Kentucky, Louisiana, Maryland, Massachusetts, Michigan, Minnesota, Missouri, Nebraska, New Hampshire, New Jersey, New York, North Carolina, Ohio, Oklahoma, Pennsylvania, South Carolina, Tennessee, Texas, Virginia, West Virginia, and Wisconsin. Beginning in 2007, APHIS initiated a search for potential biological control agents in China. Most recently, in 2015, the stingless wasp, Spathius galinae, was released. Efforts are ongoing to find and evaluate additional biological control agents. Click here to a blow up of the map. Click here to read more about APHIS’s war on the emerald ash borer.